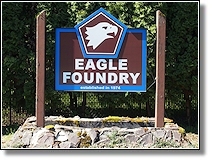 Eagle Foundry began production in 1974 as a no-bake foundry using induction melting furnaces. Our manufacturing technique continues to this day with diversification being key to our success. We started by producing high chrome white iron and servicing a limited number of customers in the farming and aggregate industries. Over the years we have developed markets for manganese, low alloy steels and air hardening pearlitic and martensitic steels. Currently we manufacture in excess of 8000 different parts. Our in-house sales staff and network of dealers allows us to market our existing products and develop new products successfully throughout the world. 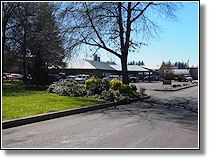 Eagle Foundry Company sits on 38+ acres in Eagle Creek, Oregon. 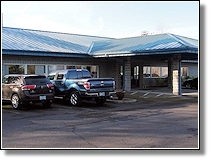 Our location consists of 68,000+ sq. ft. of building space including a pattern shop, pouring floor, metal analysis lab, sand testing lab, grinding facility and a heat treat facility. We carry a large inventory of castings for aggregate applications such as vertical shaft impact crushers, horizontal shaft impact crushers and construction equipment replacement parts. Our furnaces produce up to 35 tons of metal per day using 4 induction pots rated at 2,000 – 3,000 pounds each. Induction melting allows us the flexibility to pour many different grades of iron and steel each and every day.